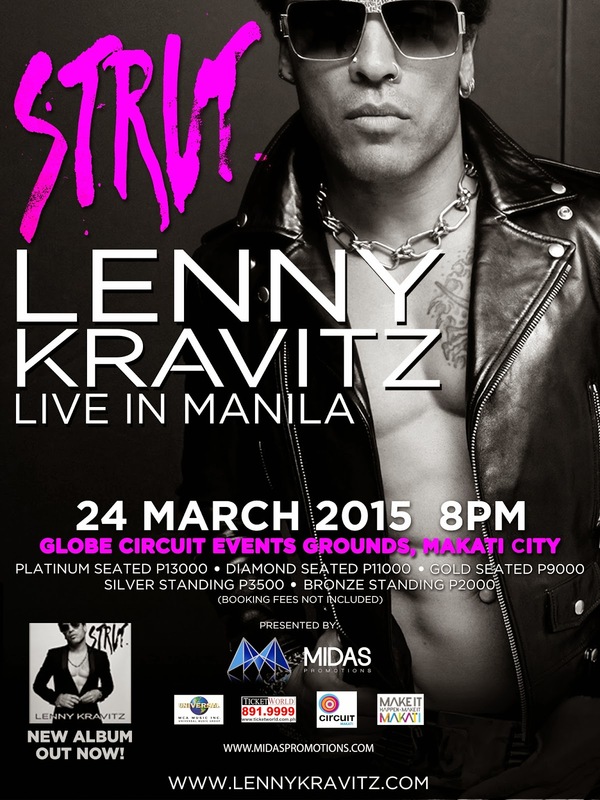 Evo & Grace: The WanderLusts: Lenny Kravitz in Manila this March! In his 20-year musical career, Kravitz has changed rock music with his own brand of 60’s and 70’s soul, rock, and funk. He stood out with his undeniable presence and classic sound, transcending race, genres, and style. The industry is definitely listening to his work with his long list of collaborations with various artists from different backgrounds like Madonna, Jay-Z, Alicia Keys, Aerosmith, N.E.R.D, Mick Jagger, P. Diddy, and more. To add to his long list of musical achievements, he holds the record for most wins in the “Best Male Rock Vocal Performance” category at the GRAMMY Awards. He has sold over 40 million albums to date. The rock icon is also an accomplished actor with notable works in the critically acclaimed movie Precious and the box-office hit The Hunger Games as Cinna. Finally, the multi-award winning singer, songwriter, and multi-instrumentalist will make you experience his raw sound live at the Globe Circuit Events Grounds in Makati City for a one-night only show on March 24, 2015 presented to you by Midas Promotions. Tickets are now available at all TicketWorld outlets. Tickets prices are as follows Platinum (seated) – 13,000 | Diamond (seated) – 11,000 |Gold (seated) – 9,000 | Silver (standing) – 3,500 | Bronze (standing) 2,000. For inquiries, call 891-9999. Get more details on www.midaspromotions.com and www.lennykravitz.com.